Mark Shaw, whose photographs of Christian Dior couture and of John F. and Jacqueline Kennedy have been rediscovered in recently published books, was a personal friend of Morse’s. Mark Shaw and Tiger Morse ran in the same circle of creative high society. Both were clients of Max Jacobson, the notorious “Dr. Feelgood,” known for liberally supplying his celebrity clients (including JFK) with “vitamin” shots of super-charged doses of amphetamines. The daughter of a prominent New York architect, Morse grew up in Manhattan and graduated from a posh boarding school. In addition to her background and design talent she had the advantage of her looks: the body of a model and the face of marvelous character. Her exuberant spirit was captured in early blackand-white studio portraits by Mark Shaw, never-before-published and included in the exhibition. Morse traveled throughout Asia on fabric buying trips and, on assignment from LIFE Magazine, Shaw accompanied her, documenting her itinerary in brilliant color. In Shaw’s photographs Morse visits a street market in Hong Kong, rides an elephant in Benares, exchanges fashion tips with a Shinto priest in Kyoto and visits waterside weavers’ compounds in Bangkok. Multiple changes of outfits show that Morse was her own best model but Shaw’s fashion portraits of Morse’s clients, including Academy Awardnominated young actress Nancy Olson and socialite Mrs. Alfred Gwynne Vanderbilt, show off Morse’s singular influence. 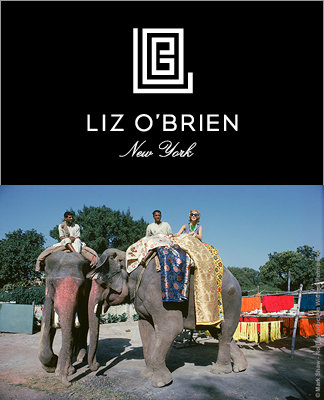 For more information on the New York show visit lizobrien.com or call 212-755-3800. For more information on Tiger Morse, visit TigerMorse.com. Wonderful Photographs by our friend, the multi-talented Lia Chang.